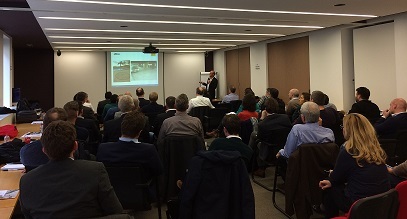 EUPAVE held its third Workshop on “Best Practices in Concrete Paving” on 23 February 2017 in Brussels. The theme of this edition was “The right concrete mix for the right surface”. Attended by around 50 participants, the workshop gathered concrete paving practitioners such as contractors, designers, engineers, academics, as well as material and equipment manufacturers. The event also marked the launch of EUPAVE’s new publication “Achieving and Maintaining the Evenness of Concrete Pavements”. Karl Downey, Secretary General of EUPAVE, opened the workshop on behalf of EUPAVE’s President, Stéphane Nicoud. 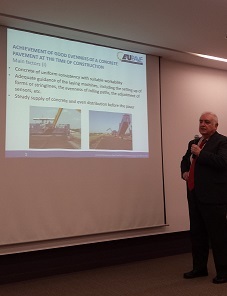 Following this, Rory Keogh, Chairman of EUPAVE’s Best Practices WG, introduced the agenda of the day and highlighted that best practice sharing is important to ensure excellence not only in design of concrete pavements, but especially in their execution. Luc Rens, Managing Director of EUPAVE, introduced the speakers and moderated the lively discussion that followed. Carlos Jofré’s presentation explained the importance of the concrete mixture for evenness and gave practical guidance. Jens Skarabis, Silentex, presented the factors that influence skid resistance and explained techniques for achieving the desired skid resistance. Martin Peyerl, Smart Minerals/VÖZ, presented the experience with two-layered concrete pavements in Austria. He noted that Austria has almost 30 years’ experience in using recycled pavements in the bottom layer of two-layered concrete pavements. In his presentation, Marco Pollok, Deltabloc, spoke about the concrete mix required for successful execution and durability of concrete safety barriers. Tim Alte-Teigeler, OAT, presented techniques for texturing concrete surfaces, such as micro-milling and diamond grinding. Finally, Frédéric Ljung, Chryso, demonstrated the wide range of surface effects that can be achieved with decorative concrete, noting that “the only limit is your imagination”. In the discussions that followed each presentation, participants shared their own experiences, which in many cases differed per country. Luc Rens adjourned the workshop by thanking the group for their active participation. The next EUPAVE workshop on innovation is already planned for 23 March 2017: registration here. The topic of the next Best Practices workshop will be determined taking into account the suggestions by the participants.